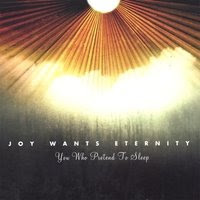 Joy Wants Eternity is a 5 piece band based out of Seattle, Washington that by sifting through materials online would lead you to believe that they are another instrumental post-rock band. Honestly that’s what I figured it would be when I initially checked out the group’s page on MySpace, but I was pleasantly surprised to hear what began to play as soon as it loaded. The song, which was “Existences Rust” from their upcoming debut album You Who Pretend to Sleep, sparked the thought in my head that if I were to be in a band like that, then this is what I would want to sound like. So I was thrilled to find the actual album show up in my mailbox this past Friday and it has proved to be every bit as good as my first impression of them led me to believe. I've collected over 5,000 mp3blog links, accessible from the alpha menu at page top. You can open frames on these blogs to view them directly on my site, and you can also view the feeds in a frame.